Psorcon is prescribed for the relief of the inflammation and itching of skin disorders that respond to the application of steroids (hormones produced by the body that have potent anti-inflammatory effects). 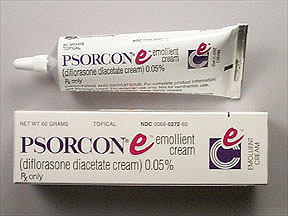 Psorcon is available in ointment and cream forms, and in emollient ointment and cream. Diflorasone is a topical steroid. It reduces or inhibits the actions of chemicals in the body that cause inflammation, redness, and swelling. Diflorasone is used to treat inflammation caused by a number of conditions such as allergic reactions, eczema, and psoriasis.